WARSAW, Nov 22 2013 (IPS) - In Maputo, a port city on the Indian Ocean in Mozambique, 44 percent of the 1.2 million inhabitants live in poverty, making them even more vulnerable to the effects of sea level rise, floods and cyclones. But despite their severe poverty, their day-to-day experience gives them practical knowledge on how to deal with climate change effects. The Public Private People Partnership for Climate Compatible Development (4PCCD) received the prestigious UNFCCC climate convention Lighthouse Award at the Nov. 11-22 COP19 climate change summit in Warsaw. The 4PCCD, declared one of the 2013 Lighthouse Activities under the U.N. Momentum for Change initiative, brought together the national government, local authorities and citizens in the construction of strategies to boost resilience against climate change in Maputo. 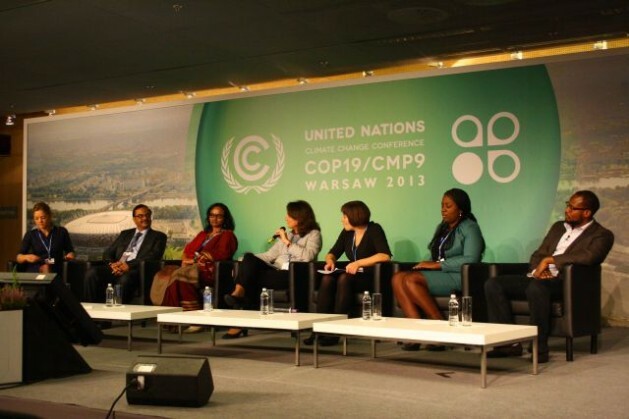 “Relating to their own experiences, citizens showed they had a good understanding of climate change,” Vanesa Castan Broto, 4PCCD project leader, explained during her presentation at COP19 in Warsaw. This is just one example of clashing realities inside the National Stadium, where the 19th Session of the Conference of the Parties to the United Nations Framework Convention on Climate Change (UNFCCC) is coming to an end. While hopes for relevant outcomes from the negotiations are fading away and national governments seem to have reached a stalemate, the success of small, bottom-up projects like the 4PCCD has brought fresh air to the corridors of the conference. On Thursday, cities and local authorities took the stage in what was the first ‘Cities Day’ ever celebrated during a COP – an initiative by the COP presidency, the UNFCCC secretariat, the city of Warsaw and ICLEI-Local Governments for Sustainability and partners. In fact, cities were for the first time allowed to participate in the official negotiations, under the “Friends of the Cities” group at UNFCCC. “We are opening up a dialogue at the national level, between national governments and cities, on what they can collectively do if they all use their maximum efforts, and what the private sector role can be in that process,” David Cadman, president of ICLEI, told IPS. Around 12,000 cities and towns already joined ICLEI’s network and decided to take concrete action on mitigation, adaptation, urban biodiversity, ecological purchasing, and ecomobility. And ICLEI is not the only network of cities engaged in tackling climate change. The Climate Alliance (CA) of European Cities with Indigenous Rainforest Peoples is another example of cross-national cooperation, where European member cities and municipalities aim to reduce GHGs at their source. Their alliance with indigenous communities through the Coordinadora de las Organizaciones Indígenas de la Cuenca Amazónica – COICA (Coordinator of Indigenous Organisations of the Amazon River Basin) is based on an acknowledgment that while industrialised countries are mainly responsible for climate change, its effects will largely impact populations that live in ecologically sensitive areas. Furthermore, protecting those areas is crucial to reducing the greenhouse effect. “Destruction of forests worldwide is responsible for about 17 percent of GHG emissions. Effective protection of this environment will only be achieved if we integrate the people who live in these environments into our protection strategies,” Brose told IPS. At the foundation of these networks is the warning by scientists that time is running out and concrete action is needed if we are to stay below the two degree C threshold of temperature rise and avoid catastrophic consequences. Yet, cities and local governments need to be included in an international framework. Hopefully, the participation of local authorities in the UNFCCC process is a good sign that such inclusion is about to happen. “Whereas national governments have been somewhat slow in terms of establishing national goals, and in achieving those goals, cities have been establishing and exceeding local goals. Cities can, and are, leading this process,” Cadman concluded.